Meadowbrook is located just 3 1/2 miles south of Hartley, Iowa. This location shows off its 'secret spot' potential with a serene country background and no city noises to bother you or your golf game. This is your chance to golf one of Iowa's "9 Hole Courses of the Year". Discover the unique challenges that Meadowbrook Golf & CC hold for your game. 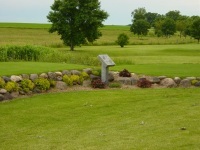 Enjoy the fabulous landscaping at our tee boxes and around the course created by our Superintendent Dan Schnell, his wife Jody, and other helpers. We feature waterfalls, a through-course stream, a pond, beautiful flowers, and wild fauna. Spacious watered fairways, quiet atmosphere, everything you need for a perfect game of golf. WE ARE OPEN TO THE PUBLIC! COME ON OVER! Our golf course features a dining room, bar, and pro shop. Check out the fantastic hamburgers at our Clubhouse Kitchen! Sign Up for Mens League Today! Mon, Tues. Early or Late, or Wed? We'd like to see you in our leagues! Men's League play on Monday, Tuesday or Wednesdays. All players require a membership with Meadowbrook G&CC before playing. Just fill out the form & click submit. ​Looking forward to seeing you in 2019! Sign Up for Womens League Today! We'd love to see you in our Ladies League! Ladie's League plays on Thursdays: Early or Late. All players require a membership with Meadowbrook G&CC before playing. If you would like to sign up, fill out the form & click submit. You can sign up to be a Sub. here too! If you need a partner or have a question, send your name and message or call.